Posted by OromianEconomist in Middle East, Uncategorized. On 25 September, Iraqi Kurds will vote in an independence referendum. Kurdish leaders a consider state of their own a just reward for their involvement in the fight against IS. Brussels, however, sees things differently. In a small room in a generic glass and concrete office building in Brussels, everything has been decked out as you would expect for a historic event. The podium is adorned with Kurdish flags; beside it hangs a map depicting the Kurdish regions in Iraq. 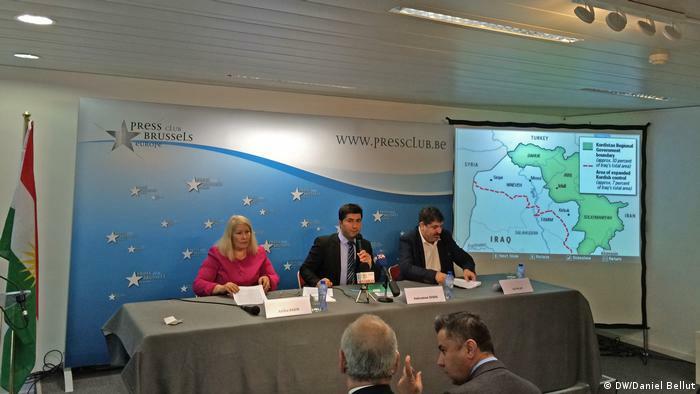 Kahraman Evsen, the president of the Kurdish-European Society, is addressing the European press to present the case for an independent Kurdistan. He takes up his position at the podium, with two colleagues sitting on either side. Solemnly they read out, in Russian, English and Kurdish, a declaration of independence from Iraq that had been signed by 60 Kurdish organizations. The press conference doesn’t go too smoothly, though. Every now and then the microphones cut out and suddenly start buzzing. There’s a permanent background murmur from talkative Kurds in the audience. Meanwhile, the representatives of the international press slouch unenthusiastically in their seats and leave the conference early. Here in Brussels, no one seems that interested in the upcoming referendum. The Peshmerga fighters of northern Iraq have proven to be a powerful bulwark in the fight against the so-called ‘Islamic State’ (IS) terrorist militia – unlike the troops of the Iraqi central government. The Kurds have made many sacrifices and endured many hardships in the process, and now Masoud Barzani, the president of the autonomous region of Kurdistan, is pressing for them to be rewarded. Kahraman Evsen says the Kurds have demonstrated that they are a reliable partner for “the civilized world.” He calls upon the central government of Iraq, Kurdistan’s neighboring countries, Germany, the EU and the United Nations to recognize the result of the referendum. 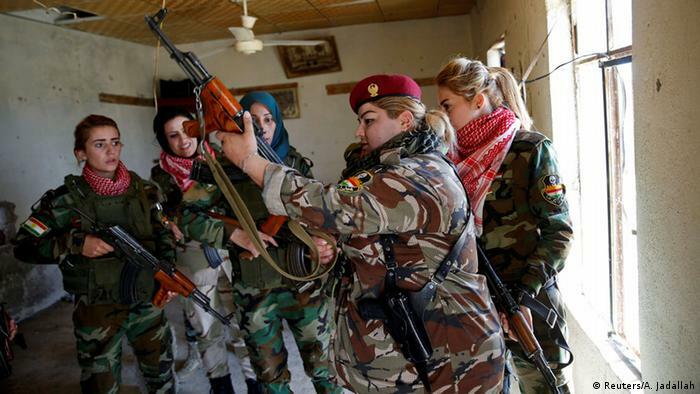 Iraqi Kurds who have fought in the coalition against the ‘Islamic State’ included female fighters, such as Haseba Nauzad (above with weapon). 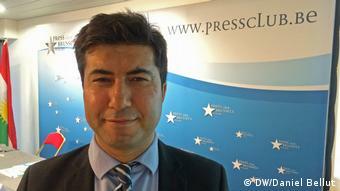 The international community greatly values the Kurdish deployment against IS. However, with the exception of Israel, there is not one single country that supports the independence referendum. US Secretary of State Rex Tillerson emphasized recently that it was far too early for independence. Iraq’s neighbors, Turkey, Syria and Iran, are concerned that an independent Kurdistan could fuel separatism among their own Kurdish minorities. The Iraqi central government is also opposed, as it is laying claim to the territories liberated by the Peshmerga – after all, the region around Kirkuk is very rich in oil. Another consideration is the fact that the region is inhabited not only by Kurds but also by Turkmens and Arabs. Piri explained there were concerns that establishing a Kurdish state at this early stage could further destabilize the already fragile region. “In the neighboring countries, Turkey, Iran and Syria, where there are Kurdish minorities, civil wars could break out … Iraq itself could also destabilize, as there are different ethnic groups in the north of Iraq. There are even rival factions among the Kurds.” The Iraqi central state must first consolidate itself before such territorial restructuring could take place, Piri added. Has the time come for Kurdish statehood? The Sykes-Picot Agreement of 1916 that established the borders did not favor the Kurds – they were given no state of their own. 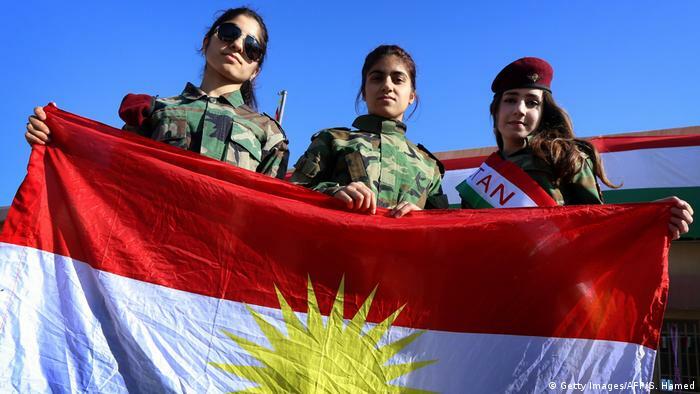 More than 100 years later, they are emerging rather better from the upheaval in the Middle East: The Kurds are benefiting from the ongoing chaos in Syria and in Iraq. However, given the united opposition of international community, their dream of an independent Kurdish state could come to nothing once again. Posted by OromianEconomist in Africa, Horn of Africa Affairs, Uncategorized. The Qatar-Gulf crisis is now affecting Africa after Saudi Arabia called on a number of countries, including Somalia, to join its boycott of Qatar. However, not every country is prepared to obey orders from Riyadh. Somalia has maintained good relations with Qatar despite Saudi Arabia, the United Arab Emirates, Egypt, and Bahrain continuing to demand that the Mogadishu government break off relations with the Gulf emirate. Still, Somalia won’t give in to pressure. 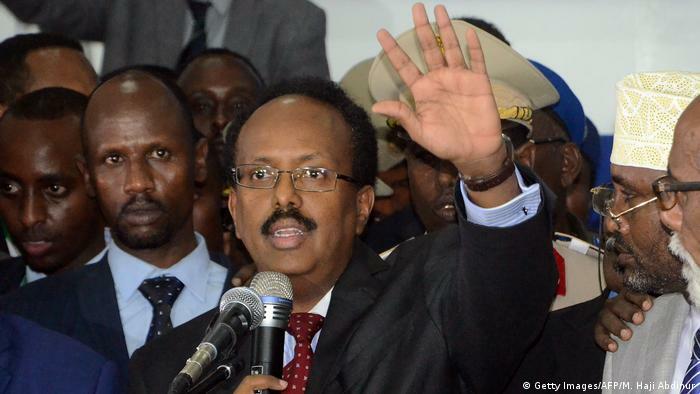 Instead, Somalia’s president, Mohamed Abdullahi Mohamed, has called on all countries involved to engage in a dialogue. Much to the annoyance of Qatar’s neighbors, he is even allowing Qatari planes to pass through Somali airspace. In doing so, Somalia is weakening the boycott imposed by the other four countries, which closed their borders to Qatar in June, followed by a breaking off of diplomatic relations and a blockade. They have accused the Qatari government of supporting terrorist organizations and demand that they sever all ties with the Muslim Brotherhood and withdraw Turkish troops from the emirate. However the emir of Qatar, Sheikh Tamim bin Hamad al-Thani, has insisted on maintaining his country’s sovereignty. Somalia’s neutrality is being tested. The country has so far had a good relationship with Saudi Arabia, its biggest trade partner in the Gulf region. In return, Somalia’s president has been supporting Saudi Arabia in the war in Yemen. Saudi Arabia and the United Arab Emirates have offered the government in Mogadishu an additional 68 million euros ($81 million) to participate in the boycott of Qatar. Nonetheless, the Somali president sided with Qatar. One possible reason is that Qatar is rumored to have financed his election campaign. “Mohamed Abdullahi Mohamed would not have become president otherwise,” Somali political expert Muhyadin Ahmed Roble told DW. “The elections were decided by the amount of money each candidate offered to parliament.” Somalia’s political elite is closer to Qatar, he says. It was the president’s chief of staff who initiated the contact with Qatar, and who has influenced the president to remain neutral in the conflict. Tensions also remain heightened because the United Arab Emirates is exerting more influence in the regions of Somaliland and Puntland. Both regions have declared their independence; however, the government in Mogadishu still considers them part of Somalia. 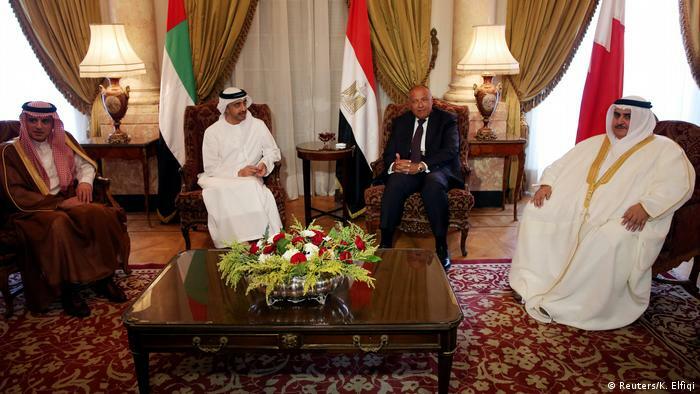 The United Arab Emirates is building ports there and wants to establish a military base. The situation in the Horn of Africa has been aggravated following the flare-up of an old border conflict in June. For seven years, the contested border between Eritrea and Djibouti was secured by peacekeepers from Qatar. When the Gulf crisis began, Qatar withdrew its troops – approximately 450 soldiers – from the Eritrean border, ending its role as mediator between the two countries. Eritrea immediately occupied the unmanned border zone northeast of Djibouti. “Eritrea doesn’t want to back down. That could lead to even greater tension between the three countries,” warns Muhyadin Ahmed Roble. All countries involved in the Qatar conflict have taken different sides. “Eritrea and Djibouti have supported the Saudis and the United Arab Emirates; only Somalia and Ethiopia remain neutral,” says Muhyadin Ahmed Roble. He adds that, in the regional power game, Saudi Arabia and the United Arab Emirates are in a much stronger position than Qatar, as Qatar only has good relations with Somalia. 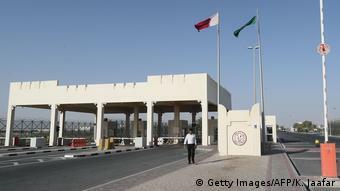 Senegal, on the other hand, maintains contact with Qatar due to a longstanding relationship. “Senegal is a special case. The country has excellent economic relations with Qatar and profits considerably from Qatari investment,” says Sounaye, adding that Senegal was better positioned than other countries, and could act according to its own interests. However, other Sahel countries have more to lose if they choose to cut their ties with Saudi Arabia. They’ve been cooperating with the Gulf kingdom for decades – but not with Qatar. Finance ministers and central bankers from the G20 group of the world’s most influential industrialised and emerging economies met in Baden Baden, Germany on the 17/18 March. The German NGO Erlassjahr.de (Jubilee Germany), which campaigns for debt relief, saw this as an opportunity to draw attention to the growing debt problems of many developing countries. The NGO has identified as many as 40 African countries which are showing signs of heavy indebtedness. “This is not surprising because today’s economic indicators are telling a story very similar to the situation in the late 1970s and early 1980s which led to the Third World debt crisis,” said Jürgen Kaiser, political coordinator at Jubilee Germany. In the wealthy industrialised countries, interest rates are very low, but in Africa investors can fetch returns of between seven and 15 percent. This leads to large capital flows from the North to the South. “The low interest rates encourage countries to take out big loans which they then have difficulty paying back,” Kaiser said. The situation becomes particularly precarious when commodity prices fall. This leads to a subsequent decline in tax revenue in economies that are dependent on oil, natural gas, coal or other raw materials. This latest debt crisis may come as a surprise to some people because numerous developing countries had a large share of their debts written down under the Heavily Indebted Poor Countries (HIPC) Initiative. However, commentators who were convinced at the time that that this initiative launched by the World Bank, the International Monetary Fund and the G-8 group of leading industrialised nations, including Germany, would solve the developing nations’ debts problems turned out to be wrong. Figures released by Jubilee Germany show how unsustainable the HIPC initiative was. Among the 40 African states where the indebtedness indicators were flashing red, 26 went through the HIPC program. One of those countries was Mozambique. In January 2017, the country ceased paying back its debts on time. In 2012, Mozambique’s obligations to its creditors amounted to 40 percent of Gross Domestic Product (GDP), they now total 130 percent. Banks and investment funds were keen to lend Mozambique money believing it would be safe because the country possesses huge reserves of coal and natural gas. Those investors have been left empty-handed. “Mozambique is a very dramatic case. It is the first country to cease repayments in such an abrupt significant manner since HIPC debt relief,” said Jürgen Kaiser. “But countries such as Gambia or Ghana, which also have an abundance of natural resources, are in a very critical situation as well. Senegal, which does not have much in the way of natural resources, is also in difficulties once again,” he added. On analysing World Bank data of African nations’ indebtedness with foreign countries, it quickly becomes apparent that a large number of African economies have recently acquired dramatic levels of new debt. Between 2005 and 2015 – the most recent year for which figure are available – Angola, Ghana, Kenya and South Africa have witnessed a threefold increase in their debt levels. Smaller countries such as Cape Verde also borrowed fresh capital during this time frame. The solution: international insolvency proceedings? Currently there is no internationally recognised set of proceedings to settle the affairs of a country which has become insolvent. Many countries have such mechanisms for individuals and companies, but all attempts to create insolvency proceedings for sovereign states have been blocked by a lobby consisting of banks and nation states. IMF Managing Director Anne Kruger proposed the creation of a Sovereign Debt Restructuring Mechanism in 2001. It would have been administered by the IMF, but the proposal was blocked by the United States. It wasn’t the only proposal. In 2014, the UN General Assembly adopted a resolution “towards the establishment of a multilateral legal framework for sovereign debt restructuring processes.” There were 124 votes in favor, 41 abstentions and 11 votes against. This resolution was non-binding and the chances of it being implemented are slim. One of the 11 states that voted against it was Germany. “That could have been a mechanism that could have helped us move forward right now,” said Jürgen Kaiser referring to Africa’s present debt crisis. “Insolvency proceedings would mean that it wouldn’t be just the creditors who would decide when debts should written down on or not. In the past that practice has led to debt relief being dispensed too late, on too small a scale, or not at all. Sovereign debt restructuring was not on the agenda of the G20 meeting of finance ministers and central bankers at the weekend, but if more developing countries follow Mozambique’s example and default on loan repayments, then it could be that G-20 will be forced to tackle the issue of debts levels. Four months after declaring a state of emergency in a crackdown on protests, Ethiopia’s government claims the country has returned to normal. Critics says the emergency decree remains an instrument of repression. This coming April marks three years since protests broke out in Ethiopia. 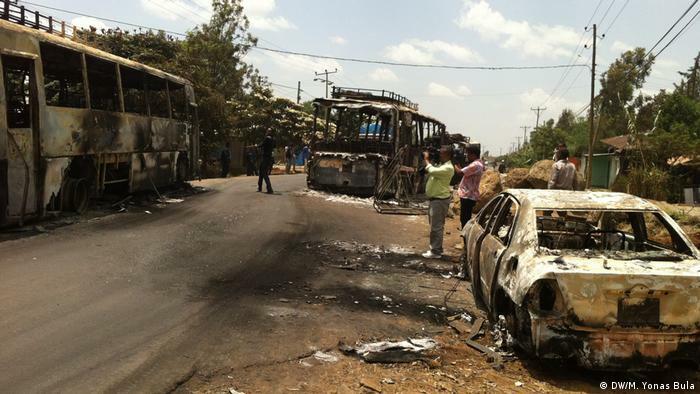 They were triggered by students in Ambo town, some 120 kilometers (74 miles) west of the capital Addis Ababa. The students were protesting against a controversial government plan dubbed “Addis Ababa and Oromia Special Zone Integrated Master Plan”. The Ethiopian government maintained that the purpose of the plan was to amalgamate eight towns in Oromia Special Zone with Addis Ababa. The scheme would promote development. However, residents in the eight towns were resentful of a plan they said had been devised behind closed doors. They were also worried that the plan, under the guise of development, would deprive farmers of their land, and have an unfavorable impact on local language and culture. 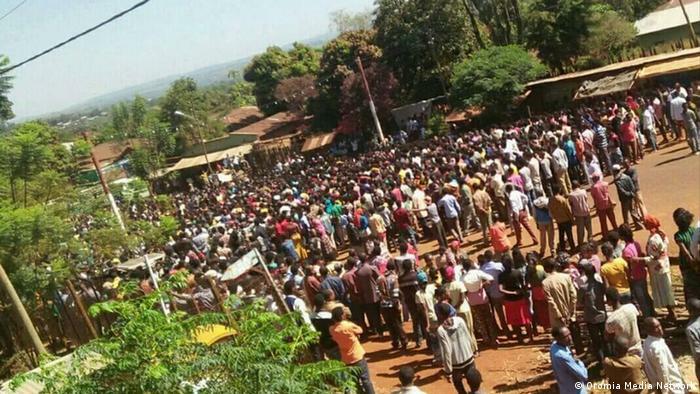 The protests which started in Ambo then spread to other towns in Oromia Regional State. On January 12, 2016, the Oromo People’s Democratic Organization (OPDO), which is the local ally in the country’s ruling coalition, the Ethiopian People’s Revolutionary Democratic Front (EPRDF), revoked the plan. But although the OPDO nominally represents regionally interests, the real power in the EPRDF is in the hands of the Tigray People’s Liberation Front (TPLF). This sense of underrepresentation helped drive the protests in Oromia Regional State, which soon reached Amhara Regional State. The response by the security forces to these protests, which had a strong following among young Ethiopians, was harsh. Hundreds were killed, thousands were injured, hundreds ‘disappeared’ and others went into exile. But the protests conituned despite this lethal crackdown. In October 2016, the government responded by declaring a state of emergency for six months. .
Negeri Lencho, the minister who heads the government’s communications office, told DW that the government had announced the state of emergency “not because it wanted to do it, rather it was forced to do it” because of the political crisis. The administration of Prime Minister Hailemariam Dessalegn claims that the state of emergency has already brought peace back to the country. Critics could therefore agrue that it would be possible for the government to lift the decree even before the six months have expired. However, Lencho says that no timeframe has been declared so far either for the repeal or for the extension of the decree. Opposition figures and members of the public DW spoke to dispute the claim that the state of emergency has restored peace to Ethiopia. The protests and the gunfire may have ceased, but the arbitrary arrests and human right violations continue. One Ambo resident, who asked to remain anonymous as he took part in the protests, said that the state of emergency had “unsettled the public’s inner repose”. Repression was still in place, he said, despite the government “falsely” claiming that life was returning to normal. “You cannot go out after curfew. You cannot stand anywhere with a few people. People are filled with fear. They fear the Command Post.” The Command Post is the government body charged with implementing the state of emergency. The town of Sabata, located 20 kilometers southwest of Addis Ababa, was part of the “Master Plan.” One local resident said calm appears to have been restored to the town which was heavily affected by the protests, However the arrests and repression under the state of emergency continue, he said. “For example, there are youths who got arrested without a warrant and have been in prison for over three months on the charge that they have listened to music,” he told Deutsche Welle. “The state of emergency is being used by the state to take revenge against youth,” he said. Mulatu Gemechu, deputy chairperson of the oppostion Oromo Federalist Congress (OFC), said a de facto state of emergency had been in force in Oromia fo some time, but by making it public the government had acquired a legal shield for further acts of repression. Gemechu added that the country can become peaceful only when the state security forces with their firearms keep their distance from ordinary citizens and stop arresting people. “If government claims peace is returning because of soldiers’ presence, then it isn’t peace,” Gemechu told DW. Thousands of people were arrested following the declaration of the state of emergency. Although the Ethiopian parliament set up an inquiry board to investigate human right violations in the wake of the state of emergency, it has yet to submit its first report. Lencho says he has no knowledge of any such report. Government and opposition parties differ over the number of people who have been detained during the state of emergency. 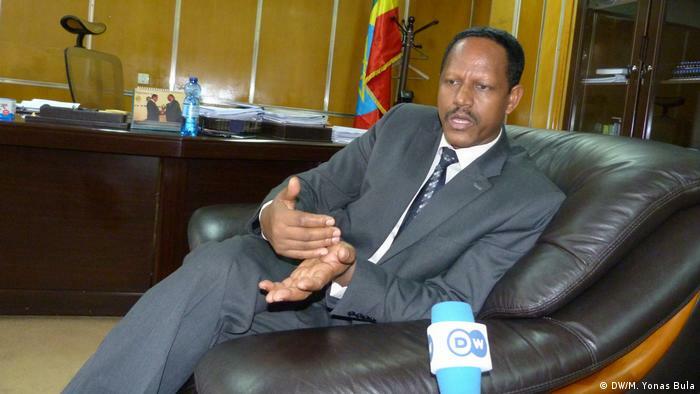 The government says 20,000 people have been arrested in Oromia, but Gemechu puts the figure closer to 70,000. The authorities said the prisoners were given “training in the constitution of the country and promised not to repeat their actions”. But prisoners said that the government, in bringing together people from different areas to one location, had give them an opportunity to get to know each other and “strengthen their struggle and learn more about politics of the country”. They are the biggest ethnic group in Ethiopia but they are rarely heard: For almost a year the Oromo people have been demanding their rights. The government has responded brutally and has now declared a state of emergency. 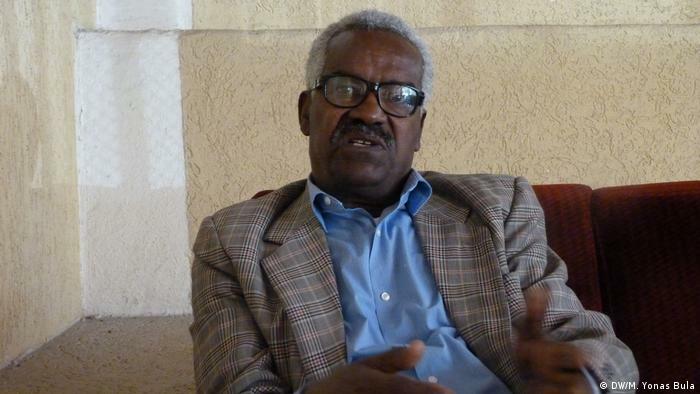 Tesfalem Waldyes felt the harshness of the regime: he was jailed for more than a year. Posted by OromianEconomist in #OromoProtests, Athletic nation. After crossing the finishing line in Rio Olympics, the Ethiopian marathon runner Feyisa Lilesa crossed his hands over his head. #DWMyPic takes a look at this symbol of anti-government protest in Ethiopia. DW Journalist Merga Yonas Bula says that silver medalist Feyisa has risked his life and family by making this gesture of solidarity with the Oromo Protests. Click here for more ‘My Picture of the Week – Symbol of protest in Rio’ at DW. In the town of Gondar in the state of Amhara, where the first demonstration took place, residents resorted to a new mode of protest – staying at home. A resident of the town, talking on condition of anonymity, told Deutsche Welle that from last Sunday to Tuesday the streets were deserted. Workers stayed at home and stores remained closed. Residents in both the Oromia and Amhara regions say that it is becoming increasingly difficult to get an internet connection and access to social media tools has been blocked. “The only way to get through is by using proxy servers,” one resident of Gondar told DW. In a recent interview with Al Jazeera, Ethiopia’s Communications Affairs Minister Getachew Reda claimed that that social media had been used “to churn out false information after false information, mostly seditious remarks, trying to agitate people against security forces and also against fellow brothers and sisters.” The administration therefore decided to gag “the kind of vitriol running over social media,” he said. The Ethiopian government receives some 3.5 billion dollars (3 billion euros) annually from international donors and has remained a key strategic partner of the West, particularly the US and the EU, in the ‘war against terror.’ However, analysts argue this financial support has been toughening the regime’s resolve to silence dissenting voices. The western approach of tiptoeing around human right violations in the country and its continued support for the regime has been stirring up anger among sections of the public. Mohammed Said, public relations officer with Ethiopia’s Communications Affairs Office, told DW that the government had its own system of checks and balances and the country’s own Human Rights Commission was doing its job in investigating and publicizing the human rights situation in the country. The Oromo people in Ethiopia have long complained of being marginalized. Addis Ababa expansion plans which sparked fresh protests have been scrapped but the conflict continues to simmer, as DW’s Merga Yonas explains. Posted by OromianEconomist in #OromoProtests, Africa, Oromia, Oromo. Human Rights Watch says security forces are continuing to persecute members of Ethiopia’s largest ethnic group, the Oromo. Hundreds have allegedly been killed in recent protests over a government plan to expand the capital Addis Ababa into Oromo land. Rights groups claim that Ethiopian security forces have killed at least 140 protesters. The Ethiopian foreign minister is in Brussels to answer questions by members of the European Parliament on the alleged offences. Human Rights Watch (HRW) last week alleged that Ethiopian security forces had killed at least 140 protesters and injured many more. 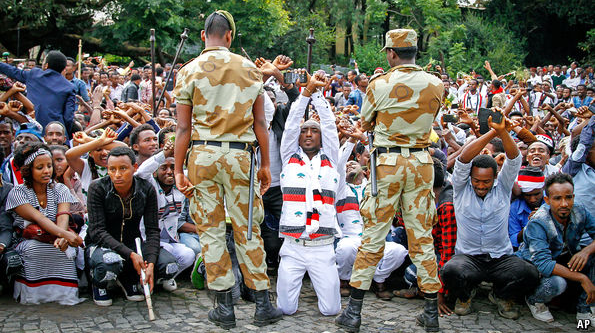 Opposition parties and activists asserted thousands of Oromo protesters had been arrested and injured since the protests started in mid-November. 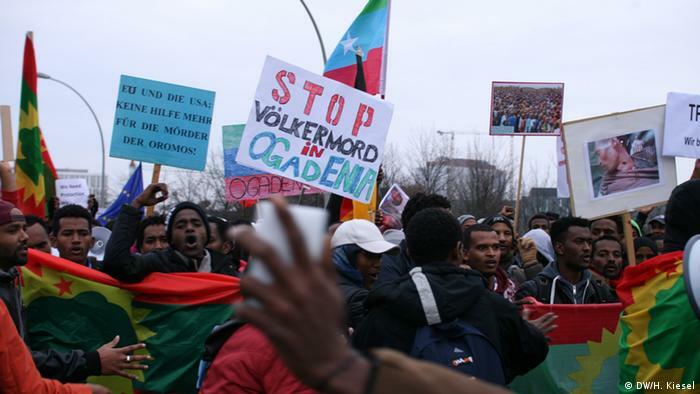 In a surprise move on Wednesday (13.01.2016), the Oromo Peoples’ Democratic Organization (OPDO) party, which is part of the ruling coalition, announced that it wanted to halt the so-called “Addis Ababa Masterplan” which is at the root of the ongoing crisis. The plan involves the expansion of the capital into the surrounding Oromia region. Government spokesman Getachew Reda told reporters that the government would respect this decision, but that they would still prosecute those who had participated in the protests. The plans to expand Addis Ababa were hotly contested by members of Ethiopia’s largest ethnic group. Universities across the country turned into battlefields, with police firing live bullets to disperse the crowds. On social media, Ethiopians united under the hashtag #OromoProtests and Ethiopians of all ethnic backgrounds staged vigils all around the world. 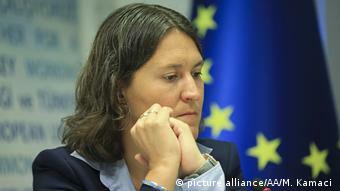 Another topic on the Brussels agenda is the recurrent drought that has hit the country. Estimates say that as many as 15 million people could be threatened by hunger this year. With Ethiopia ranking fifth on the table of aid recipients globally, raking in some $3.8 billion (3.5 billion euros) in 2014, donor countries have a responsibility to follow up on how the government handles human rights issues, Daniel Bekele, Executive Director with HRW’s Africa Division, told DW. Ethiopian legal expert Awol Kassim Allo said he would like to see a space for all Ethiopians to participate in the political arena. “Only with such an approach can there be a possibility of paving a way to move forward,” he told DW. In the last general elections in May 2105, Ethiopia’s ruling coalition, the Ethiopian People’s Revolutionary Democratic Front (EPRDF), won 100 percent of the seats in parliament. In a recent debate, Bekele Naga, Secretary General of the opposition Oromo Federalist Congress(OFC), told DW’s Amharic Service that “the constitution of the country proclaims that the land belongs to the people.” He added that the Ethiopian government “has been engaged in land-grabbing, leading to cultural genocide [of the Oromo people].” Another Ethiopian legal expert, Tsegaye Ararsa, complained that no government officials, including Prime Minister Hailemariam Desalegn, have publicly voiced regret over the loss of young protesters’ lives. He believes there should be an independent fact-finding committee to look into the case. In an interview with DW, a spokesman of the Ethiopian Federal Democratic Unity Forum accused the government of abusing the country’s constitution with its plans to expand the capital Addis Ababa. 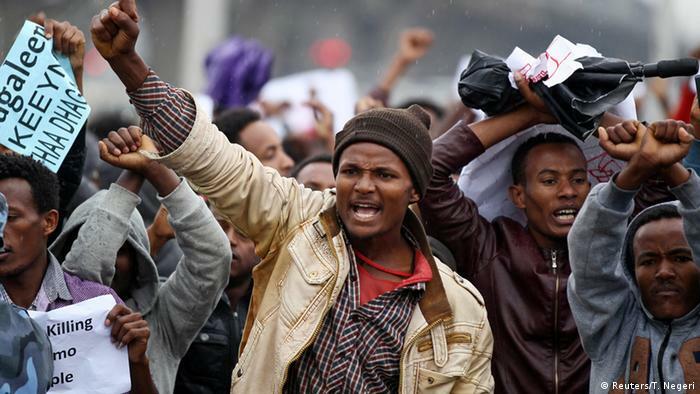 Violence and chaos gripped Ethiopia this week as thousands of demonstrators took to the streets in protest against government plans to expand the capital Addis Ababa. Human Rights Watch said at least 75 people were killed in a bloody crackdown by heavily armed security forces. 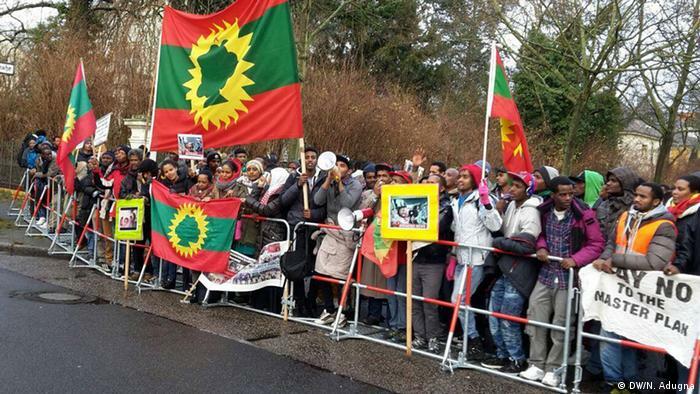 The demonstrations have spread to several towns since November, when students spoke out against plans to expand the capital into Oromia territory, a move the Oromo people consider a land grab. DW spoke to Merara Gundina, chairman of the opposition Oromo Federal Congress, in Addis Ababa. DW: What exactly are you demonstrating against? Merara Gundina: The Addis Ababa Master Plan is part of a larger land grab by the Ethiopian government around Addis Ababa, which has displaced not less than 200,000 people. Secondly, under federalism all the boundaries are being eroded by the ruling party which is bent on taking the land. People are very angry with the government and people who wanted to see change are frustrated. 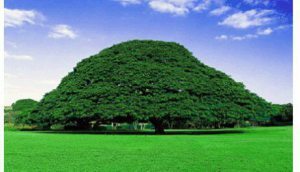 Under the Ethiopian constitution all land belongs to the state, with people living there legally considered tenants. Doesn’t this allow the government to carry out any developments that may serve the interests of all Ethiopians? No, no, the government is misusing it. The constitution says the land belongs to the public so it doesn’t allow the government simply to tell the people “go away” and it takes the land. No, it says there are bonds of state in the name of the people and there are individuals owning the land. It is the ruling party that is misusing the constitution. In fact, the state itself is privatising the country. We understand you have vowed to continue the demonstrations despite the killings and Prime Minister Hailemariam Desalegn declared on television that the government would act without mercy. Is it not better to solve these issues through talks? We continue to support the cause of our people. We continue our peaceful struggle. We cannot be intimidated as the government has done. We have popular support, we have millions of people behind us. The government cannot silence us easily. We are following the constitution but we are against the arbitrary misuse of the constitution by the ruling party. Our people will continue. Is it true that your organization is getting support from outsiders? The diaspora is far away. It’s school kids, high schools and universities and the government is simply accusing the left and the right. Probably the diaspora is very active in the media because the local media are totally controlled by the government. We have no access to the media and the diaspora have some media outlets and they report what is happening in the country. But a diaspora of a few thousand cannot move millions of people. 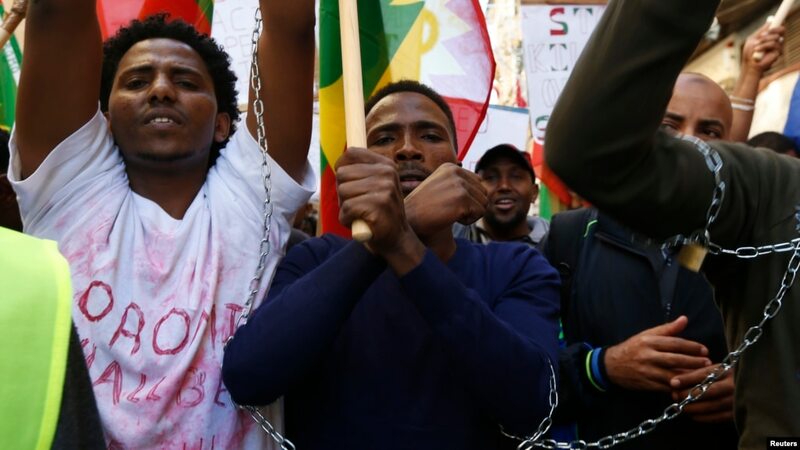 Ethiopian migrants, all members of the Oromo community of Ethiopia living in Malta, protest in Valletta against the Ethiopian regime’s plan to evict Oromo farmers to expand Ethiopia’s capital, Addis Ababa, Dec. 21, 2015. GINCHI, ETHIOPIA—Schools are closed, businesses have just reopened after being closed for almost a week, and there is tension in Ginchi, Ethiopia, one of the first towns where the Oromo people began protesting last month against a plan to expand the capital, Addis Ababa. Police are on the main road in Ginchi, which is about 80 kilometers west of Addis Ababa. Interviews have to be conducted on the basis of anonymity and on the outskirts of the town. A waitress says that despite the reopening of the cafe where she works, life is not back to normal yet: She says that there is not an official curfew, but that young people risk being randomly detained if they are out in the evening. The most recent protest in Ginchi was last weekend, after a funeral. Citizens said security forces killed three people before the protest took place. The Addis Ababa master plan is a blueprint to expand the capital into the Oromiya region. The protesters believe that the expansion will lead to land grabs without proper compensation and a loss of the Oromo culture and language. A shop owner, who participated in the protests, says those who created the master plan do not understand that life is tough and that people like him will not benefit from the promised development. He says there is no benefit for the people to have outside investors who take their land. The Oromiya region was established when the current government came to power in 1991. The federal system was divided along ethnic lines. The Oromos are the largest ethnic group in the country. Bekele Gerba, leader of the opposition Oromo Federal Congress, lives in Adama, the former capital of the Oromiya region. 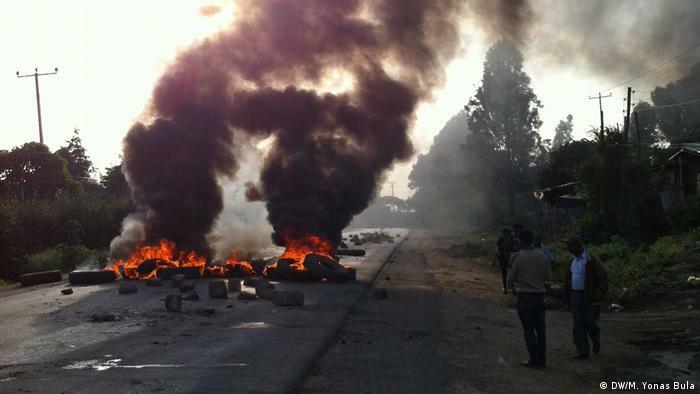 The city, about 60 kilometers south of Addis Ababa, has also seen protests in recent weeks. Gerba says Oromos have never been treated like equals by Ethiopia’s leaders, but he believes the current government is the worst. Gerba’s party says more than 75 people have died since the protests began, and that many of his party members have been detained. Rights organizations such as Human Rights Watch say the government is using “excessive lethal force” on the protesters. For years Ethiopia has crushed anyone who opposes its development plan. Now an ethnic uprising threatens to crash the country’s high-flying economy. A human rights watchdog has reported that 75 people have been killed protesting a government project in the Oromia region. 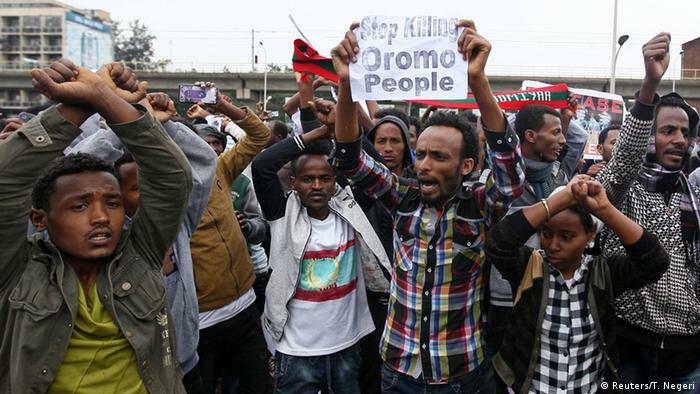 Human Rights Watch (HRW) said on Saturday that at least 75 people had been killed in recent weeks while protesting an urban renewal plan in the Oromo region surrounding the capital, Addis Ababa. Opposition groups say security forces have killed several people during weeks of protests over a government re-zoning plan. 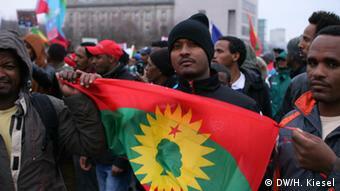 Members of Ethiopia’s largest ethnic group view the plan as an infringement on their rights. “Police and military forces have fired on demonstrations, killing at least 75 protesters and wounding many others, according to activists,” the human rights watchdog said in a statement. In November, students peacefully demonstrated against government plans to take over territory in several towns across the region. However, the unrest was met with a severe response, including government forces using firearms against protesters. 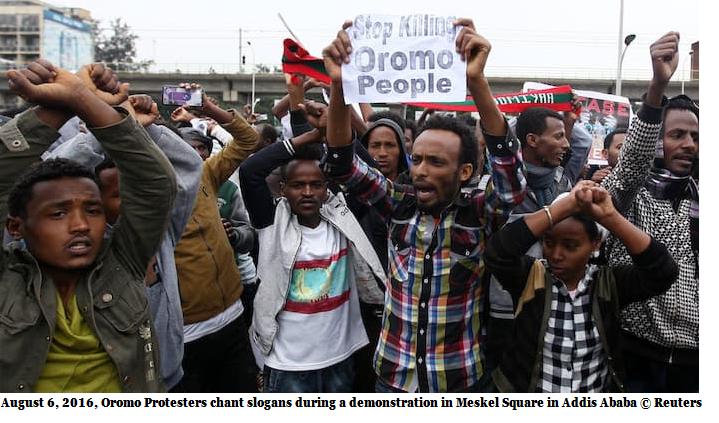 “The Ethiopian government’s response to the Oromo protests has resulted in scores dead and a rapidly rising risk of greater bloodshed,” said HRW’s Deputy Africa Director Leslie Lefkow. “The government’s labeling of largely peaceful protesters as ‘terrorists’ and deploying military forces is a very dangerous escalation of this volatile situation,” Lefkow added. He said only five people had died, dismissing the higher toll reported by activists. Oromo opposition leader Bekele has announced his support for peaceful protests, according to DPA news agency. “Grievances have accumulated over the years. Over the evictions, but also over the lack of democracy in this country, the human rights abuses and the level of poverty,” Gerba said in a statement. “The United States is deeply concerned by the recent clashes in the Oromia region of Ethiopia that reportedly have resulted in the deaths of numerous protesters,” the State Department said in a statement.